Mkts end higher ahead of US FOMC meet. Gearing to face much awaited the Fed decision on the rate hike, the Indian stock markets on Wednesday rallied 1 per cent driven by banking stocks. However, there is not much of enthusiasm on broader markets which underperformed benchmarks. Mumbai: Gearing to face much awaited the Fed decision on the rate hike, the Indian stock markets on Wednesday rallied 1 per cent driven by banking stocks. However, there is not much of enthusiasm on broader markets which underperformed benchmarks. Sensex ended higher by 258 points at 25,964 and Nifty closed at 7,899 level higher by 70 points, however, midcap index down 0.17 per cent and smallcap index down 0.44 per cent. On the other hand, the RBI is expected to reward markets with rate cut in its next monetary policy review drawing support from macro-economic data. Meanwhile, the Indian rupee traded stronger at 66.39, up by 3 paise, against US dollar. On the sectoral front, 9 out 12 sector based indices ended higher with bankex leading the rally up by 1.4 per cent, while consumer durables and capital goods indices reported reverse trend. From banking shares, Axis Bank, HDFC, HDFC Bank, ICICI Bank, SBI ended up to 2.5 per cent gains, while export based IT and pharma rallied on healthy consumer spending in US, with Wipro, Infosys, TCS gained up to over 1 per cent each. The pharma companies like Sun Pharma up 2.3 per cent and Lupin gained nearly 1 per cent. 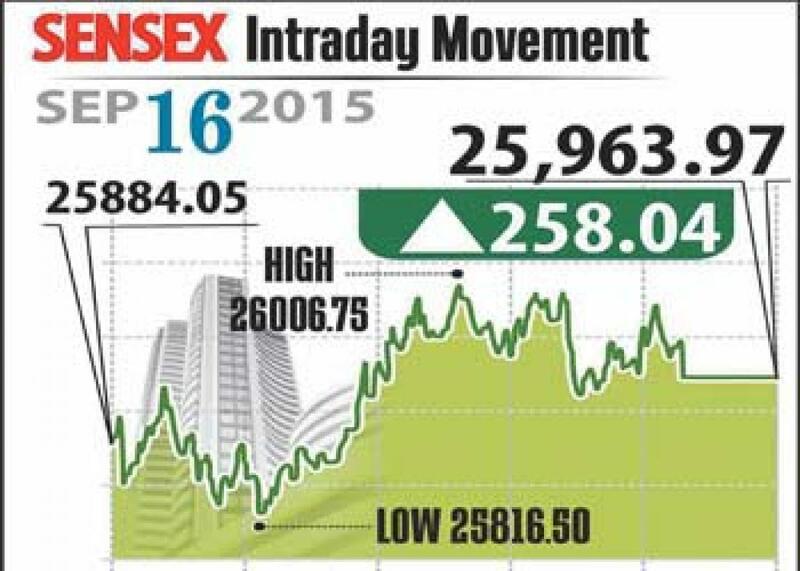 Taking support from inflation numbers, the FMCG firms rallied with ITC up 1.5 per cent and HUL closed flat. The gainers: Bharti Airtel, up 2.48 per cent at Rs 359.10, Sun Pharma, up 2.38 per cent at Rs 887.35, Axis Bank, up 2.35 per cent at Rs 494.10, and Hero MotoCorp, up 2.27 per cent at Rs 2,363. The losers: BHEL, down 0.66 per cent at Rs 210.30, and L&T, down 0.58 per cent at Rs 1,547.85. The markets will remain closed on Thursday to mark the festival of Ganesh Chaturthi.